Rudrama Devi is a prestigious project of director Guna Sekhar. Theatre trailer of the movie is released yesterday and within 24 hours it received more than six lakhs hits. Audience was eagerly waiting for the trailer. The trailer as well as the posters that were released recently increased expectations on the movie. Vijayawada: Anushka is playing the title role in the movie Rudrama Devi. This is first 3D historical movie in Telugu. Other actors in the movie are Rana, Allu Arjun, Nitya Menon and Catherine. According to the producers of the movie, the theatrical trailer is released in 2D, as mentioned in official Facebook page. Rudrama Devi theatrical trailer is of 2.14 minute duration. It offers the look of all important characters in the movie. It is a treat to watch the dialogues, background score, camera work and the artwork. However the graphic work is seems to be a big disappointment. The trailer of Rudrama Devi received great response from the audience. More than six lakh people watched it in just one day. Most of the negative comments are about the poor graphic work. Anushka is playing the character of Rudrama Devi, Rana is Veerabhadra and Allu Arjun is playing the character of Gona Gannareddy and it appears that he is going to be the highlight of the movie. The movie is written, directed and produced by Gunasekhar. Music is composed by Ilayaraja and camera is handled by Ajay Vincent. 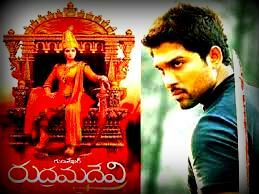 Rudrama Devi Telugu movie is going to be released on April 2th this year. This was informed by the distributors. This is one month before another big project Bahubali will be released. The movie will be released both in Tamil and Telugu at the same time. It is also made in Malayalam and the release date may be same for the Malayalam version also. The movie is supposed to be released for Sankranthi last year but due to delay in post product work, the release was postponed. This entry was posted in Entertainment on March 4, 2015 by Rakesh.